How fitting that the thirteenth day of our trip would be the one where the trip finally caught up with us. Need more clichés? How about "It was the seventh day of our visit to Turkey, and since it was good enough for God, its good enough for us - we were ready for a rest." Last night's party after midnight, combined with too much sun, food, drink and fun as finally worn us out. Stacy woke up before the muezzins, needing water... then came back to bed for awhile. We managed to get up for breakfast, but then retreated back to the room for a rest til the afternoon. Finally we got motivated to do something - we had to get a new piece of luggage to transport all the goodies we'd bought. So we headed out of the hotel toward the Arasta Bazaar at the Blue Mosque. 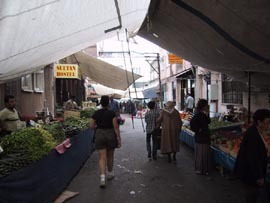 We weren't very willing, facing aggressive street merchants after such a dozey morning didn't seem like a fun thing to do. As we approached the bazaar, Stacy pointed out a sign near the entrance way - the Mosaics Museum. We decided we'd rather look at mosaics first. 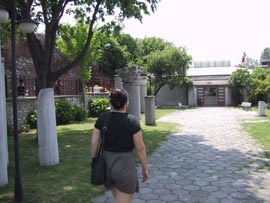 Almost at the side entrance to the Arasta Bazaar when... Stacy turns off at the last moment for the Mosaics Museum. The bazaar is to the left of this picture. Much to our chagrin (that we had almost passed it by), the Mosaics Museum was fabulous! The mosaics date back to early Byzantine times, and had been rescued from ruins of the old palaces before the Ottomans took over Constantinople. Only a relatively small amount of the mosaics remain - there were once whole buildings with this amazing art form used as flooring. 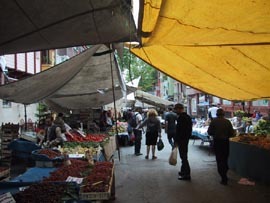 It only took about an hour to explore the entire museum, then we were rejuvenated enough to tackle shopping in Istanbul. 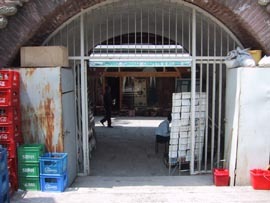 We walked through the bazaar looking for luggage, and found it at the last shop in the line (figures). The exit side of the Mosaics Museum put us inside the bazaar. This is a look down the length of it. The store with luggage was at the very end. Once you've settled into serious shopping at a store, the tea comes out. 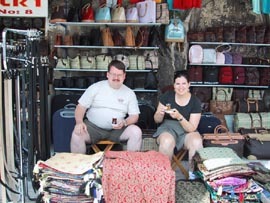 Here we are drinking tea and looking at kilims in Danny's store in the bazaar. In a few minutes we had located a decent size piece of rolling luggage for all our Turkish acquisitions along with a few other goodies (wouldn't want to give away what presents we bought). Feeling much better (and having accomplished our primary goal for the day), we stopped back at the hotel and dropped off our latest items, then headed down toward the farmers market we had been told was set up on Wednesdays nearby. 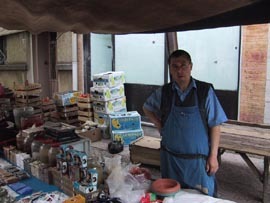 Along the way we bumped into Zülküf, who was shocked that we remembered his name, much less were able to pronounce it. 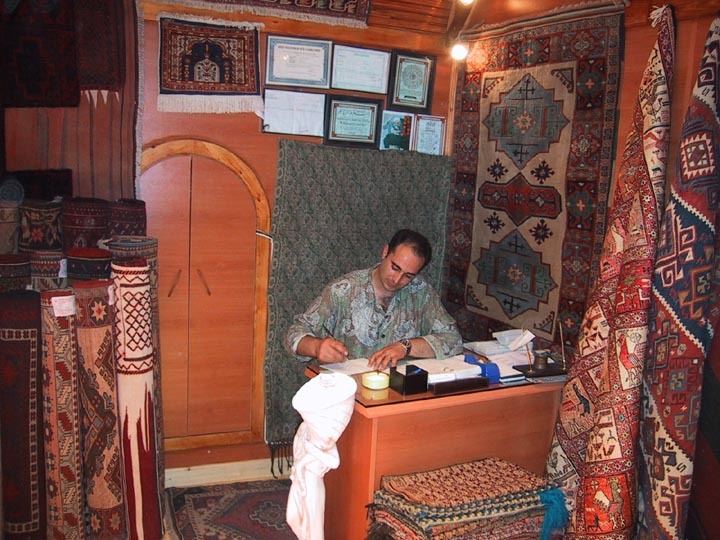 He's standing in front of the carpet store he sells for. 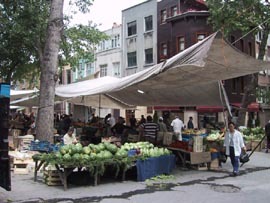 A block further down the road was the farmer's market. 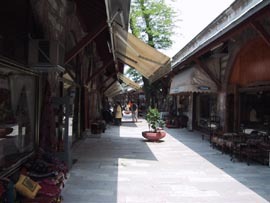 This is actually a street in Sultanahmet, most of the stores (particularly the restaurants) along the street are closed, since no one can get to them. Stacy wandering up the street. 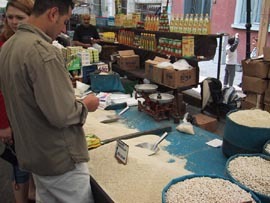 There was little pitching to the tourists - this is a locals market, selling produce, homewares, spices, etc. No souvenirs here! The market stretched several blocks, all under these large canvas tarps. And it was a very windy day, these tarps were banging fiercely. 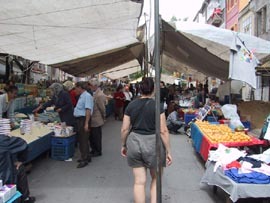 Here Stacy has rounded a corner - the market extends down a cross street and around another corner. This storekeeper gave Richard a bit of cucumber he cut with a small knife. He even had a little salt for taste. 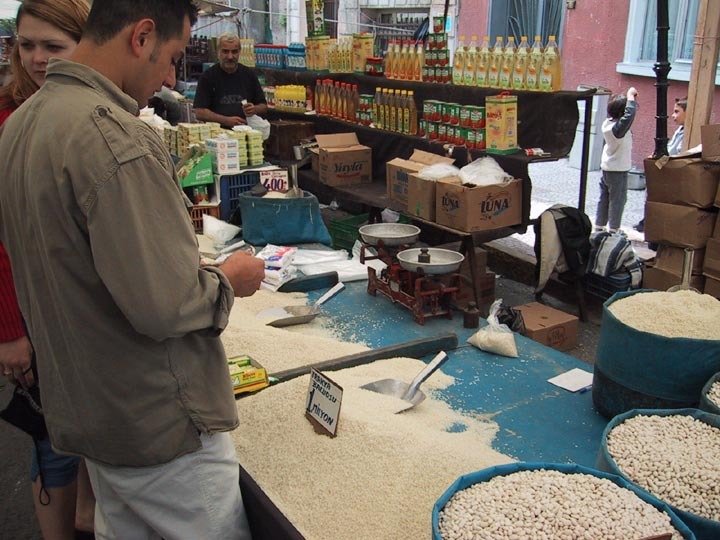 He also had the only electronic scale in the market. 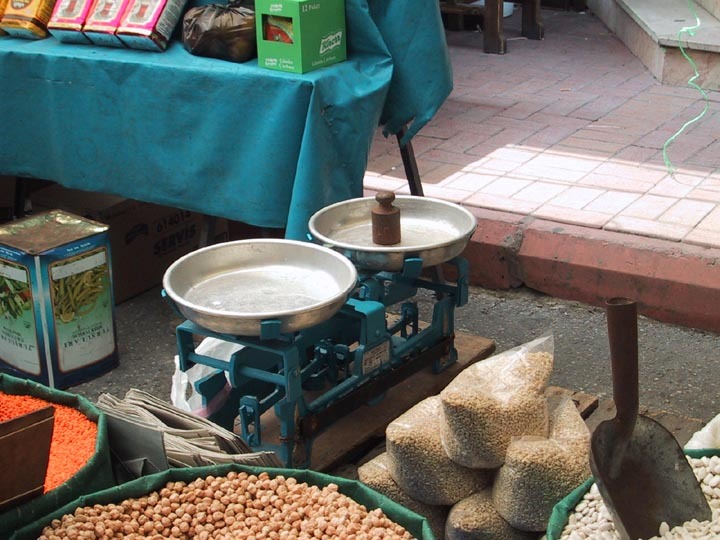 A grains shop, notice the mechanical scale and weights. A better look at the old style scales used in the farmers market. 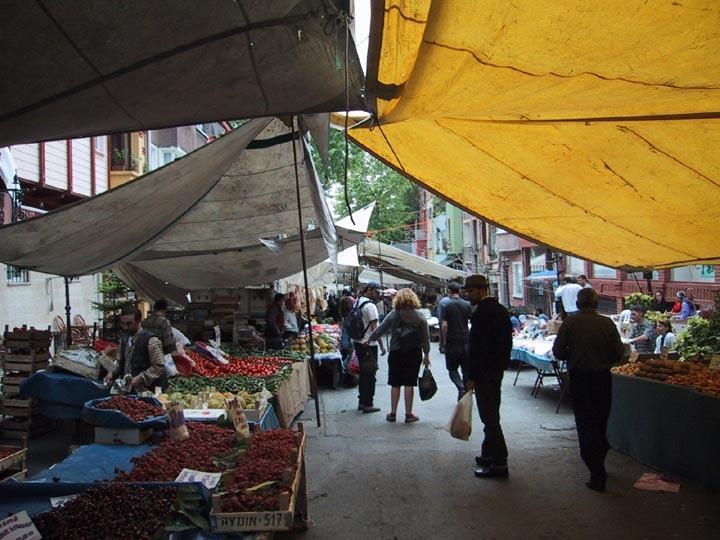 While in the market a gentlemen walked up to us and said in crisp English "Shame on you for only taking photographs - you need to taste!" A bold and not typical opening for a street merchant, it turns out that Faruk was not a street merchant at all, but an import/export specialist for Kilims. His perfect English comes from dealing with Americans on a regular basis. We sat down in his store to talk the politics and culture of Turkey and traded contact information. A very interesting and articulate fellow (and we're not just saying that because he'll likely see this page!). 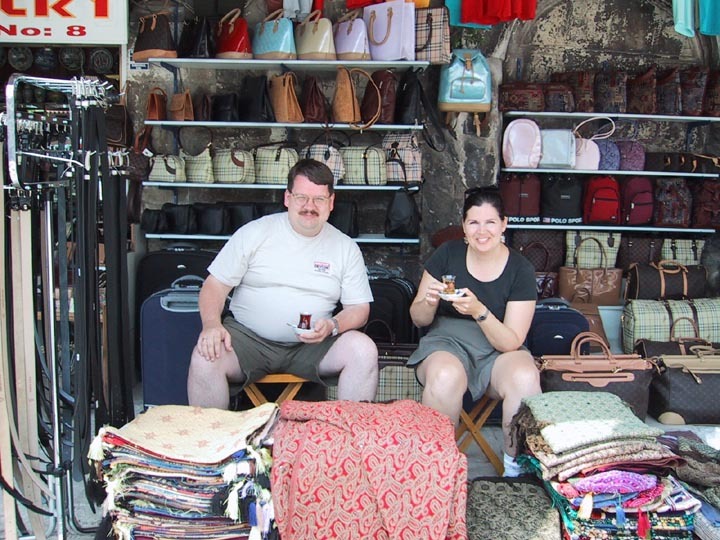 Our wander through the market was rejuvenating and since it was our last day in Istanbul, we decided we would finally give in and do a little shopping at a carpet store. 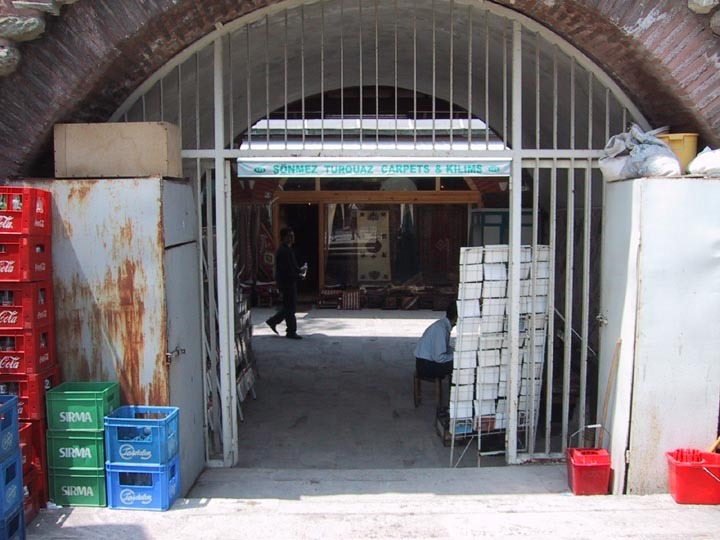 During the week we had been invited into innumerable store, and had even been given "demonstrations" in a few. 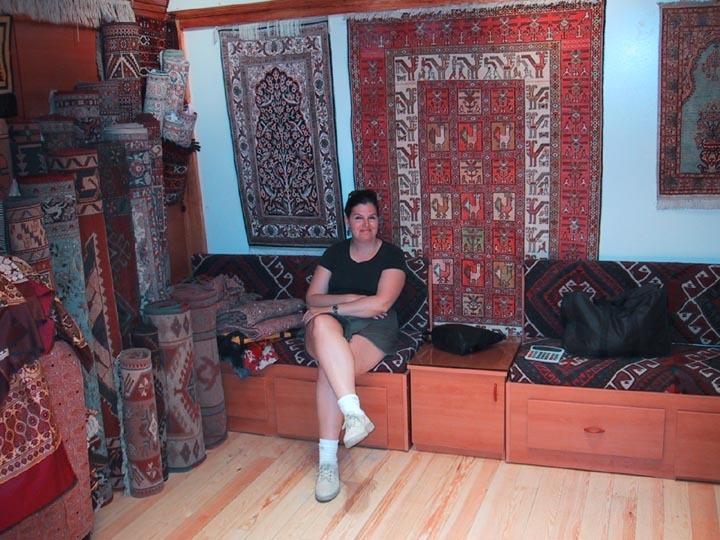 The one that made us most comfortable was Kanen's shop in the Arasta Bazaar, just across from the hotel. So much to the surprise of Kanen, we dropped in and did a little shopping there too. Stacy relaxing after making some carpet/kilim buying decisions. A happy Kanen writes up the paperwork for our purchases. And no, we're not going to tell you what we bought - that'll be another surprise when we return home. Our new acquaintance Faruk had given us a name of a restaurant he frequents in the Taksim area of Istanbul - one area we still hadn't explored. 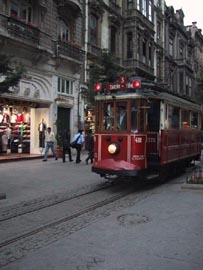 When we got back to the hotel we made reservations, and then a short while later grabbed a taxi to Taksim. 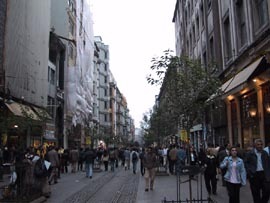 Taksim is another local shopping district, focus around Taksim square. The drive took awhile, but the area was swarming with locals and in-the-know tourists, it had a similar feel to Robson Street in Vancouver. We wandered the streets for awhile until we found the restaurant. 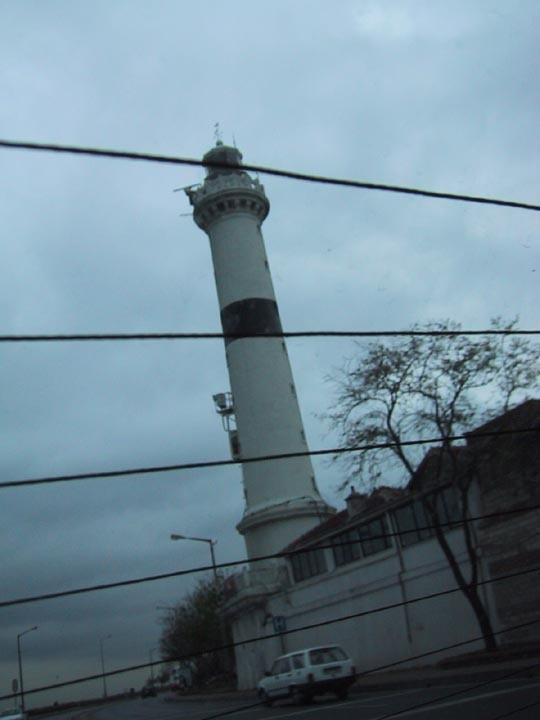 On the drive to Taksim, we got a look at the lighthouse at the entrance to the Bosphorus, just at the foot of Topkapi palace. 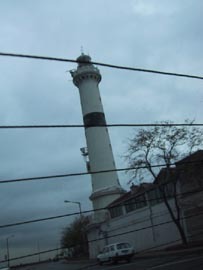 There has been a lighthouse of one form or another on this spot for more than 2,000 years. 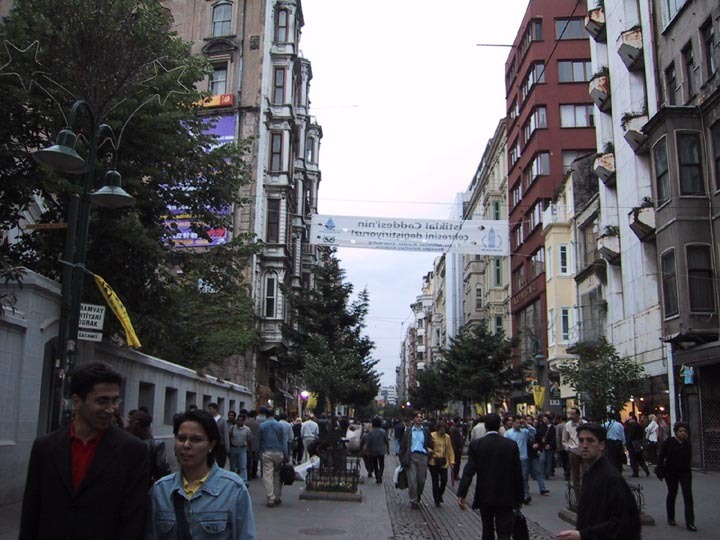 In the Taksim area, on the main street. 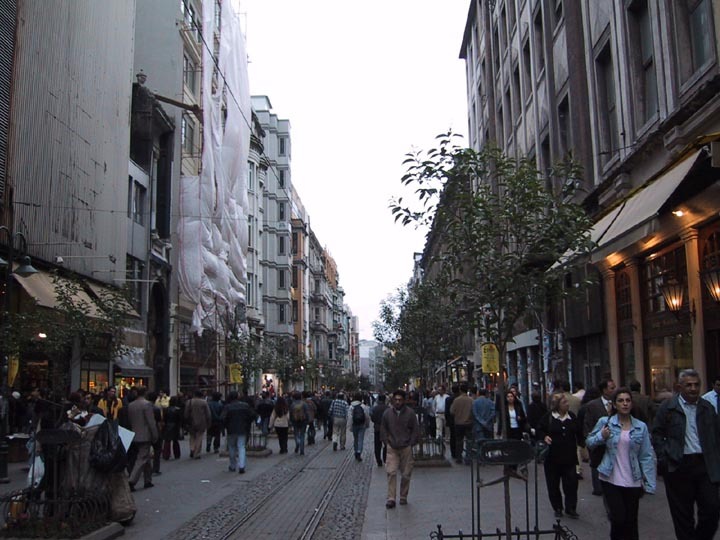 Shops and restaurants line the street and the surrounding blocks, and there are people everywhere. There's a steady roar of noise as well - music playing from the shops, lots of talking, buskers and hawkers on the street. Down the middle of the road runs a small electric trolley, different from the other trolleys of Istanbul - older, apparently. Full, and knowing we had plenty of time the next morning, we skipped packing that night and went to bed. The next morning we would leave Turkey.